A guest post by Anne Stine, one of our Hubbard Fellows. All photos are by Anne. A couple of weeks ago (in mid-October) I noticed unusual egg cases about 2-3 inches off the ground on the base of Siberian elm saplings in one of our more tree-infested tracts. I noticed the casings because I was basal bark treating their hosts. The placement of the cases and the size of the host trees were pretty uniform. The egg cases themselves look like limpets and are about 1 cm wide by 2 cm long. I know they’re egg cases and not cocoons because I snapped one open to see what was inside. Egg case, with PVC kill-stick for scale. What species are these mystery eggs, and do they parasitize Siberian elms? If anyone has answers to these questions, I’d like to hear them. It would be great if SOMETHING ate Siberian elms. Combating invasive/aggressive trees is a major task here on the prairie. Deciduous trees are especially hard to kill. Their root reserves make them more resistant to fire, and they sucker when girdled. Because of these limitations, basal bark treatment (kill-sticking) in combination with removal of parent trees is often the most sensible course of action. Kill-sticking is problematic because it is extremely time consuming, and is ineffective on large saplings with thicker bark. 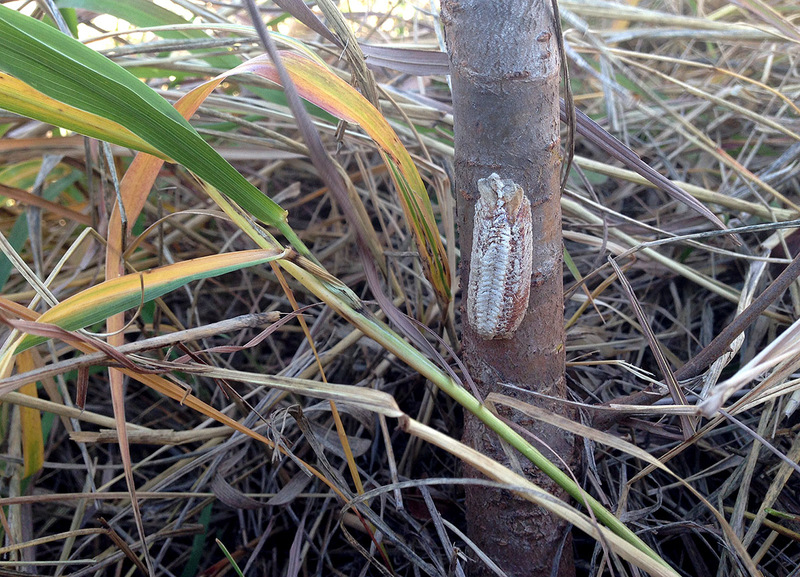 Here’s hoping these little eggs grow up to be hungry adults with a taste for elm! 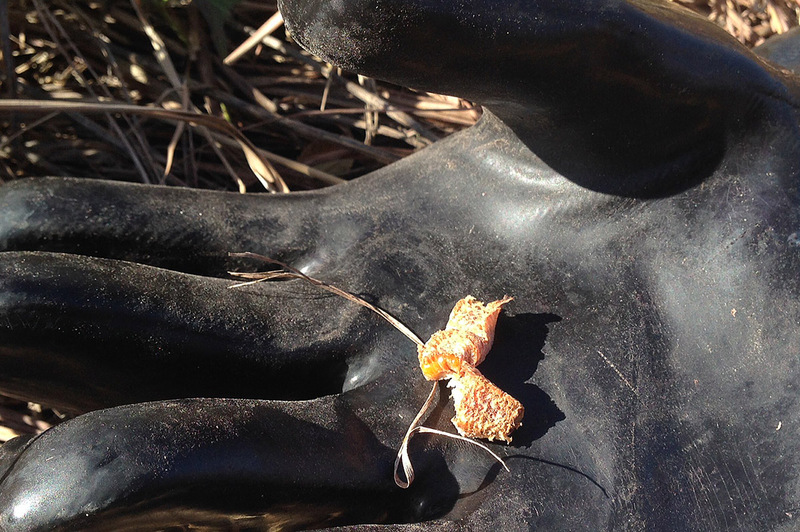 Open egg case on rubber herbicide glove (for science!). Back-side up. This entry was posted in Prairie Insects, Prairie Natural History, Prairie Photography and tagged egg case, great plains, identification, insect, insect eggs, mystery, nebraska, prairie, siberian elm by Chris Helzer. Bookmark the permalink. I don’t believe they will eat Siberian elms. Good luck! 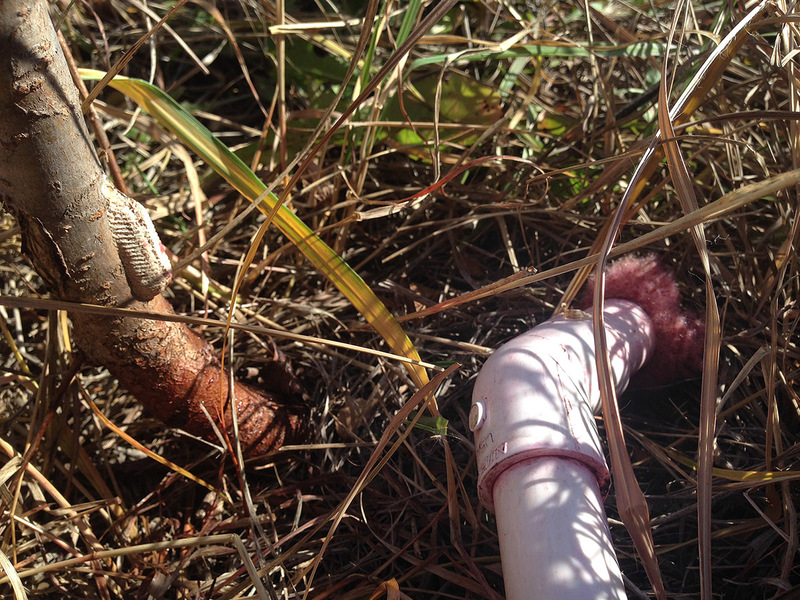 Hi Chris, just wanted to let you know that I made a kill-stick this year and found it to be very effective for eliminating saplings…sumac, dogwood, and prickly ash seem to be quite sensitive, with green ash being slightly less so. To keep the dribbling down, I only open the ball valve to fill the end and then close it until the herbicide is nearly gone, and then repeat. For storage, I just cover the end with a couple plastic bags and tie the end off with a twist tie and store upright. No leaking. Great tool! Patrick – that’s great to hear! Glad it’s working out for you, and that you’re already making tweaks to the performance… A good trait in any land manager! Anyone else out there familiar with it and would you recommend it? Eeeks, didn’t mean to give such a plug to amazon.com here. Surprised to see how the simple link I pasted was displayed. Here is what I do. Save the mantis eggs along with your winter seed store. After the spring burn while sowing seed place the eggs in one of the burnt tuffs of grass. Chris, I posed your question to Phil Peliterri, the Wisconsin State Entomologist. He said he thought it was a Mantid Egg (Preying Mantis) an Ootheca Case. I am copying Phil on this email. Thanks to all for the info. I never knew we had native Preying Mantis. I looked at the links provided and can say that I’ve seen both types of egg sacks. I did find a native one this summer, not realizing at the time that it was native. I left it alone and am so glad I did. Hello Anne, I have not tried girdling Siberian Elm. What other trees tend to resprout when girdled? I know girdled green ash tends to heal. In this case, periodically removing scar tissue until the tree dies would be necessary. I do recall some buckthorn sprouting below the girdle. However, the buckthorn eventually was killed by my girdling. This does not mean girdling will always work on buckthorn. I have found girdling to be useful for trees with single trunks. If there are a dense cluster of many trunks, like a stump resprout, then I think it is just easier to use carefully applied herbicide.